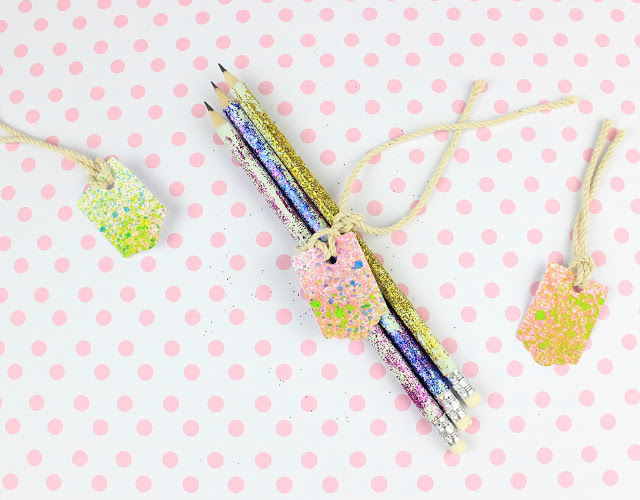 Diy Back to School Colored Glitter Pencils!!!! 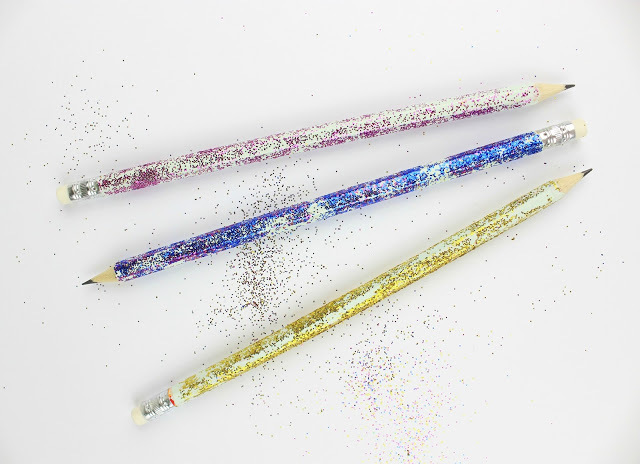 Diy Back to School Colored Glitter Pencils and let’s make them unique! And we are almost ready!!!! 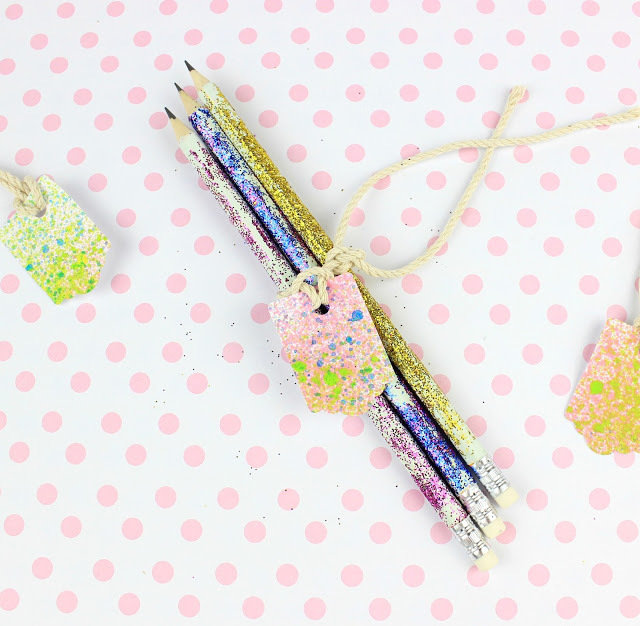 Back to school in a few days and we are on hurry to finish all the things we want to have… you know… a beautiful pencil case, handmade bookmark clips, labels for our bag and of course glitter pencils! Because a princess always loves glitter and stardust!!! Every year we are having the same issue… my princess does not want to use pencils without anything on them, like glitter or colors or patterns or anything! But on the other hand, everytime I buy for her the pencils she wish to have, they are not that good! So … problem can be solved easily! Just use the “good quality” pencils and let’s make them perfect for a princess! 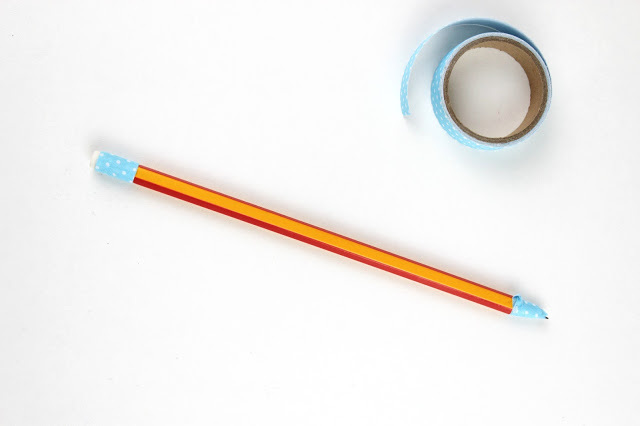 Use the tape on your pencils and cover the places that you do not want to paint. Start painting the rest of the pencil and let it dry. 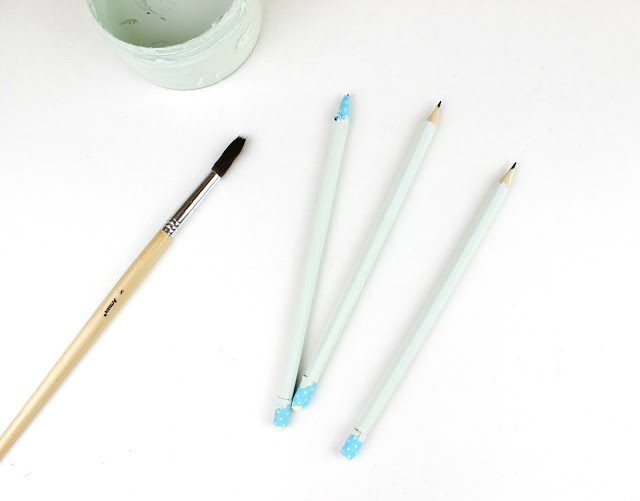 In a plastic bowl mix the white glue with water (1:1) and apply it on the pencils. Spread the stardust on the pencil and let it dry. If you wish to have more than one color, just use more colors of the glitter. Even though our pencils are not fully covered with stardust, I thing this pattern (you know here there is stardust, but there is not) is more beautiful! The pencils are ready! The procedure was fun and that’s why my princess decided to make a few additional for her friends! And a small colorful back to school gift is ready for her beloved girlfriends. 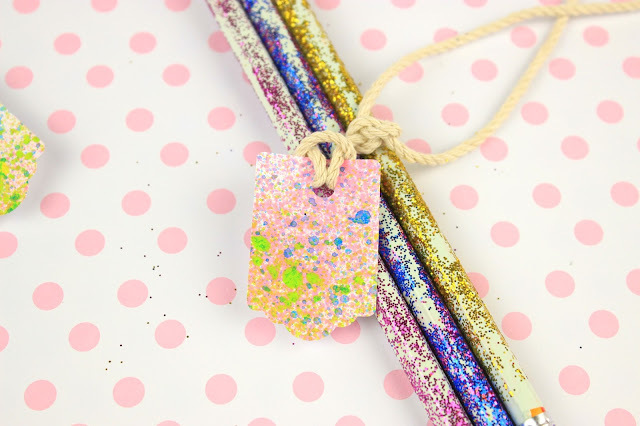 Just do not forget to use your oen handmade Spray Painted Gift tags! To be honest, I prepapred a couple for me two in blue shades and I love them!!!! My best wishes for all the little students, to have a wonderful and full of memories school year! Τι ομορφούλικα! Καλή και λαμπερή σχολική χρονιά να έχουμε!!!! Γκλίτερ παντού! η χαρα της κοριτσομάνας! κατι τετοια βλέπω και ζηλευω….! This DIY is so cool. I wonder if it will work just as well with glitter paint. I can't believe it's time to go back to school! These are so cute! My daughter loves anything DIY and glitter! Oh I love this! They look great and so much fun to make your own too! I need to do this. You always give wonderful ideas on DIY things. This time DIY glittery pencils and I would now make it myself with my innovations by following your tips. Thanks for sharing! 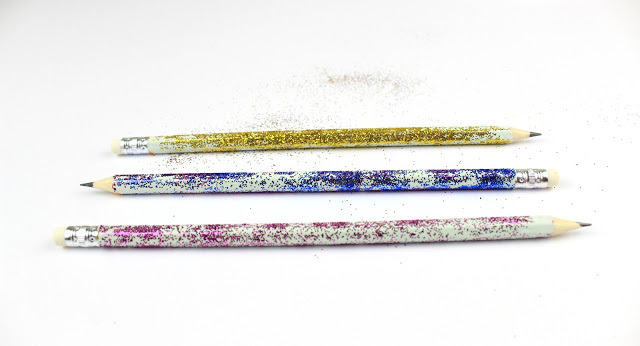 Every girl would love to have glitter pencils in her pencil box. They are definitely meant to belong to a princess. I can't believe how easy it is to make them as well. Αυτά είναι μολύβια, αστραφτερά,για πριγκίπισσες και νεράιδες.Τελεια όλα.Καλη σχολική χρονιά! This is such a cute yet easy DIY for the kids (or anyone) to do. I love how you also incorporated those DIY tags with these pencils, both make beautiful and thoughtful gifts for kids. Ααααααα θέλω κι εγώ! Μου αρέσουν πολύ αυτά τα γυαλιστερά μολυβάκια … σου φτιάχνουν την διάθεση χαχαχχαχααχ! Πανέμορφη και πανέξυπνη ιδέα, Ζίνα μου. Θα την εφαρμόσω!!! Ευχαριστώ για την έμπνευση. Σε φιλώ, φίλη μου. This is a fun back to school gift. I like how easy it is to create. Cant wait to do this at home. This is an awesome idea. I love glitter and I never thought that I can revamp my pencils that way too. This really is a gorgeous and affordable way to glam up school supplies. I was at Target and glitter pencils were so much more expensive than just getting these supplies and making my own. Such a lovely gift to give to friends or even teachers too. Oh I love this craft. This makes a boring pencil attractive. I might as well try this with my kids who really enjoys arts and crafts. Πραγματικά ότι πρέπει για μικρές πριγκίπισσες! Καλό ξεκίνημα να έχετε στο σχολείο!